No matter how many times it happens, there is always an adrenaline rush when I see my float disappear under the surface of water, or my lure gets bumped as it cuts through the creek. I still get that rush now, even after more than 25 years of trout fishing. I was fortunate enough that my Dad took the time to show me how to trout fish when I was younger, to do everything in his power for me to gain the necessary skills, and above all else, have patience. We have spent many hours together, wading through the local streams and creeks, making some incredible memories along the way that will stay with me for the rest of my life. I want my kids to make these same type of memories as they grow up, and they aren’t going to be able to do that in front of a TV or computer. It has taken me a long time to realize that going fishing is more than just about catching fish. It’s about spending time in the outdoors with my family or a good friend. I’ve seen incredible sights and have had amazing experiences while trout fishing. 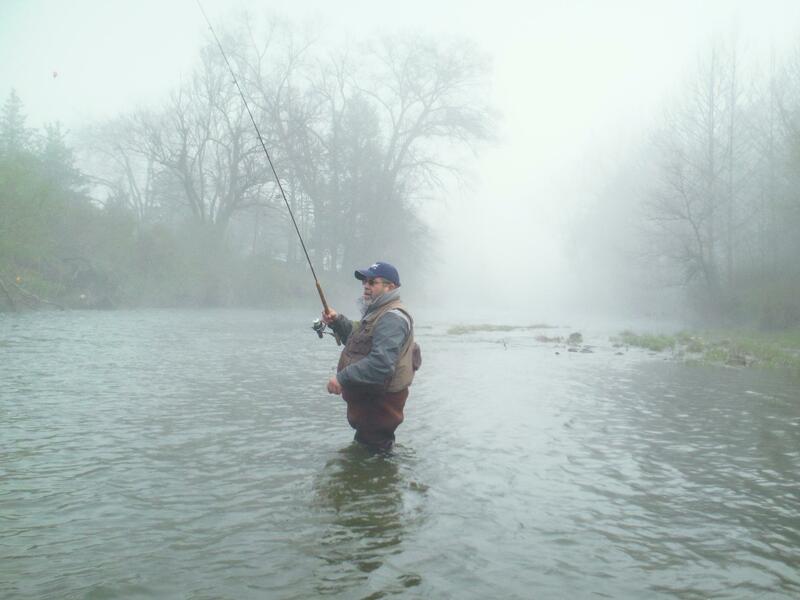 The bald eagle gliding just above the tree tops with a fish in its talons, the fawn bedded in the bushes on the bank just a few yards away, casting out into the water as the fog lifted off the surface during a cool morning, and catching fish while in the middle of a torrential down pour are all experiences burned into my memory while fishing with my Dad. It might have been the selfish side of me, wanting the best of both worlds, spending time with my daughter and trout fishing. I put her in a hiking carrier for toddlers and we went to the stream to go fishing, and she loved it. She yells at the fish to stop flopping as I reel them in, she always wants to touch the fish, and her favorite part is throwing them back in the water. This is probably the last year she will be able to fit in the carrier, so I’ve started to teach her to fish with her own rod and reel. It’s going to be a daunting challenge, but I’m more than willing to tackle it head on and with enthusiasm. When my Dad first started teaching me how to trout fish, he never got much fishing in for himself. He was always quick to hand me his rod when I got a snag or tangled around a tree branch. Five minutes later when I had another issue, he was right there to switch rods again. If he happened to get his line in the water and had a bite, he was quick to give me that spot and show me where to cast. He did everything possible so that I could catch fish and have fun. My Dad is not the most patient man in the world, but he had it in spades when he was teaching me how to fish. My wife and I had just started dating when she mentioned she wanted to go fishing with me. But, instead of creating a lifelong fishing partner, I ended up pushing her too hard, I did not have the patience with her, and effectively squashed her desire to go fishing. That is a mistake that I do not take lightly, and vow not to repeat. 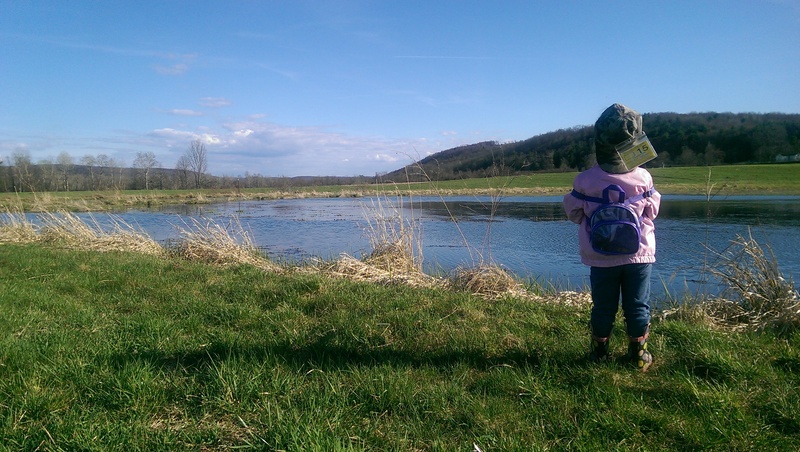 I’ve sat down and thought about a plan on how to teach my daughter to fish. Only go on relatively warm and sunny days. It is not much fun for a kid to be cold and wet while standing in the rain. 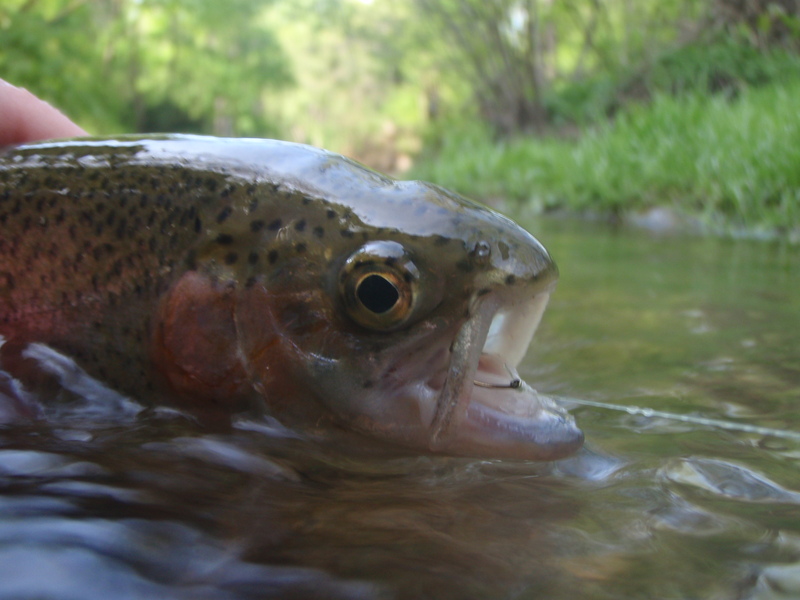 Pick fishing spots that are close to home, have easy access points, and don’t require a long walk in to the stream. This spring we have fished at our neighbor’s pond and at a State Park reservoir, both have short walks and are close to home. If she wants to stop fishing to play, let her. Whether it’s in the shallows looking for crayfish, on the stream bank building a stick fort, or going down the slide at the nearby park. 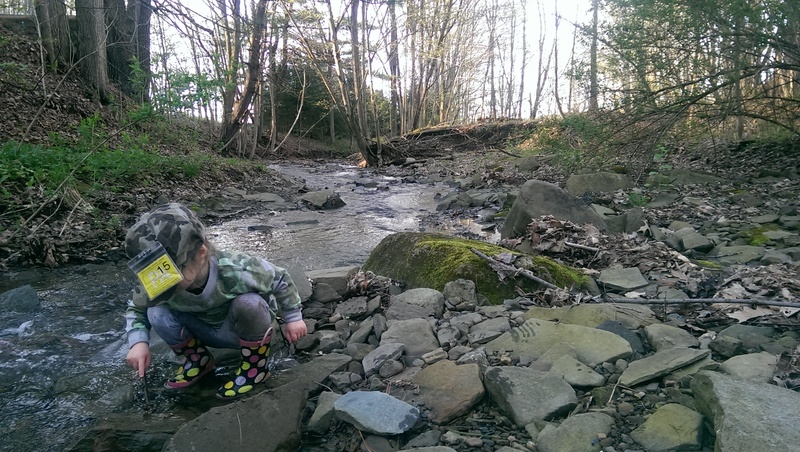 This will be a perfect time to show her the aquatic insect life in the stream, the caddis larvae in its case, the different nymphs crawling on the bottom of a submerged rock, and explain some of the stream entomology. Snacks are essential. Keep her happy, bring snacks. When she says she’s done and wants to go home, we’ll call it a day. Patience, patience, patience. I need to find the patience that I didn’t have when I was fishing with my wife. I have been given a second chance, with my daughter, and I don’t want to make the same mistakes. Hopefully with my plan, I will be able to grow and nurture her love for fishing and make sure that it’s something we can enjoy together for years to come.